Woodland Park Zoo Blog: Name our new otters, win an ice cream party for 100! Name our new otters, win an ice cream party for 100! We’re teaming up with Umpqua Bank to name our new playful pair of Asian small-clawed otters, residents of the new Bamboo Forest Reserve exhibit. Two lucky winners will each take home a $100 Umpqua Bank savings account*, a ZooParent adoption, and a visit from an Umpqua Bank ice cream truck for 100 friends! The contest began Friday, May 24 and will continue through Saturday, June 15, 5:00 p.m. PST. As a tribute to the otters' native southern and southeastern Asia range, all qualified name entries must be submitted in the Malay language. The winning names will be chosen by a panel of zoo judges. 1. Look up words or names in the Malay language. Choose two names, one for him and one for her. 2. Pick up a ballot at any Seattle area Umpqua Bank store, clip out a ballot from select issues of The Seattle Times, or submit your otter names online at zoo.org/nametheotters. 3. Wait until the final two names are chosen to find out if you won one of two grand prizes! 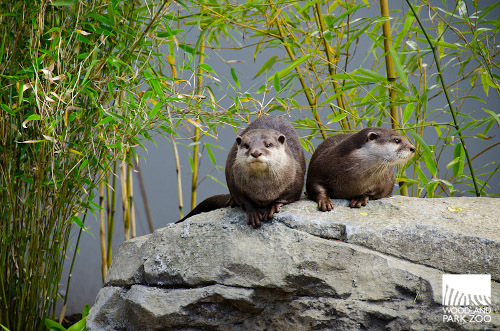 The Asian small-clawed otters debuted May 4 during the grand opening celebration of the new Bamboo Forest Reserve exhibit, but their welcome to Woodland Park Zoo won’t be complete without your help! Log on to zoo.org/nametheotters to submit names for your chance to win big. *Grand prize winners will receive a $100 savings contribution within 30 days of Umpqua Bank account opening. Account requires a $100 minimum opening deposit and may not be redeemed for cash. All other applicable terms and fees of the savings account apply; see account disclosures for detail. For official rules and regulations, visit zoo.org/nametheotters. When will they post the winner? Our judges are still going through the entries and we hope to have a winner announced next week. Stay tuned!